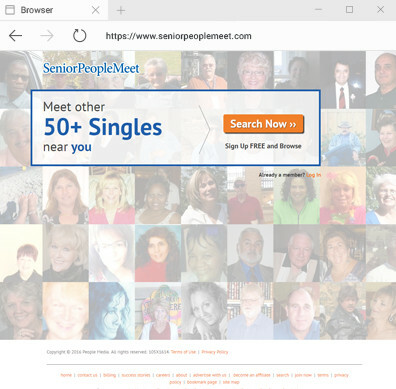 Singles who are 55 years old and older join SeniorPeoplemeet.com because it is the most popular dating site for people like them. They find ways to get to know others which oftentimes produce deep long-term relationships. The site understands the limitations of its members so its developers created a site that is easy for them to learn. With a user-friendly interface and easy to use navigation tools, the members easily learn how to use the site to communicate with others. Many of the members are not familiar with the use of the Internet but they find SeniorPeopleMeet.com easy to understand and in a short time, find someone they enjoy chatting with. SeniorPeopleMeet.com targets senior singles or those aged 55 and above. With a huge number of visitors, members easily find a match with similar traits and qualities. There are more women being 59% of them while only 41% men. SeniorPeopleMeet.com offers free trial so that its members can browse profiles of other members in their area. Although the site offers discounted rates in their 'Today's Special Offer' feature, the following are the rates for the regular subscription. Fast sign up procedure. Once you reach the homepage, you are immediately given the chance to join the site by filling in a few personal information. User-friendly interface. SeniorPeopleMeet.com has been developed with their members in mind with quick sign-up and easy navigation features which results in a user-friendly experience. Audio and video messaging. Most dating sites offer instant messaging but only a few allow members to send audio and video messages and SeniorPeopleMeet.com is one of them. Profile. Free members can search and view as many profiles as they want even if their access of the features are limited. However, all members have the option to limit who can view their profile and message them. Insufficient dating tips. SeniorPeopleMeet.com offers limited dating advice unlike other popular dating sites that give comprehensive dating tips to ensure success in their endeavors in the site. No phone support. Members who encounter problems that need to be responded right away cannot reach the customer support staff immediately because there is no phone customer service support. Need to pay for more features. Just like most dating sites, free members enjoy limited access and they need to spend money in order to send instant messages and communicate with potential partners. Easy profile completion. SeniorPeopleMeet.com members take only little time to complete their profile. Communication support. The site offers suggested matches based on the member's profile information. Aside from that, this unique dating site for senior singles offers sample messages for members who have a hard time initiating conversation with those that interest them. Live chat. One of the benefits of being a paid member is the ability to communicate with other members by being able to send them an instant message which can start a conversation or a live chat. My Match. This feature assists its members find compatible matches by specifying age range, location or status and the site produces the matches and send them to the member's email. "I'm interested." Members get to know other members in the site through this feature that acts like a slideshow with its showcase of its members one at a time -- a picture and a few bits of information, and as the member view them one by one, he or she can click "No, next profile" or choose "Yes, next profile". To make things simple for its members, SeniorPeopleMeet.com offers an easy way to sign up with a few information that are asked as soon as they decide to join the site. The member undergoes the quick process in less than two minutes so there is more time to browse profiles. SeniorPeopleMeet.com offers its members dating tips and advices that can help them find the right partner. This site has been successful in matching compatible members. Success stories and testimonies posted in the website prove that this website has helped a high number of members find what they are looking for. The site has a high trust level that has ensured members of their privacy and security. Worrying about privacy and safety is the last that senior singles should feel of a dating site. SeniorPeopleMeet.com understands this predicament so it ensures its members with a complete protection against scam and fraud. The site has taken some measures to ensure that the personal confidential information of the members will never reach third parties for any reason. There are various reasons why senior singles in the site can sleep with a peace of mind. With an easy and quick sign up process and easy navigation, SeniorPeopleMeet.com makes its members comfortable with filling in their profile by making the registration simple so that the member will have more time to browse other profile. Among the relevant features contributing to the ease of use of this site are the search functions, left navigation, and the Help page. SeniorPeopleMeet.com is definitely the best online dating site for senior singles aged 55 and older. It has successfully presented itself as one of the dating sites that have helped its members find the person they want. The user-friendly interface has greatly helped the members navigate and the effective communication tools have sparked conversations. SeniorPeopleMeet.com is one of the best sites for senior singles.